Julius Frazier Peppers (born January 18, 1980) is an American football outside linebacker for the Green Bay Packers of the National Football League (NFL). He played college football at North Carolina, where he was recognized as a unanimous All-American, and was drafted by the Carolina Panthers second overall in the 2002 NFL Draft. Peppers has also played for the Chicago Bears. Peppers was born in Wilson, North Carolina, and raised in nearby Bailey. By the time he was a freshman at Bailey's Southern Nash Senior High School, Peppers had grown to 6 ft 5 in (1.96 m), 225 lb (102 kg). Ray Davis, the football coach at Southern Nash, felt that Peppers would be an asset on the gridiron for the Firebirds, despite the fact that Peppers had never played football before. Davis' gamble would pay off. During his high school career, Peppers played running back and defensive lineman, finished his career with 3,501 rushing yards and 46 touchdowns, and was one of the most dangerous defensive linemen in the state. He also lettered in basketball and was voted all-conference as a power forward for four consecutive years. In 1998, Southern Nash won the state championship in track for the first time in the school's history. Peppers contributed as a sprinter, winning the state championship in the 4×400 meter team relay (3:23.10 minutes) and finishing second as a triple jumper (14.05 meters). He was also rumored to have cleared 2.03 meters in the high jump. During his senior year (1997–98), he was named to the Parade magazine high school All-America team in football as an all-purpose talent and was also named Male Athlete of the Year by the North Carolina High School Athletic Association. In 2005, Peppers was named by the Rocky Mount Telegram newspaper as one of the 50 Greatest Athletes from the Twin County (Nash and Edgecombe) area. Peppers attended the University of North Carolina , where he played defensive end for the North Carolina Tar Heels football team from 1998 to 2001. As a true freshman in 1998, he was redshirted. Peppers led the entire nation with 15 quarterback sacks during his sophomore season (2000), and earned first-team All-Atlantic Coast Conference (ACC) and second-team All-American honors. Following his junior season in 2001, he was a first-team All-ACC selection, and was recognized as a unanimous first-team All-American. He also won the Chuck Bednarik Award as the nation's top defensive player and the Lombardi Award as the best collegiate lineman and the Bill Willis Trophy as the nation's best defensive lineman. In the three seasons at North Carolina, Peppers started 33 of the 34 games in which he played. He is currently ranked second all-time in UNC history with 30.5 sacks. He accumulated 53 stops behind the line of scrimmage, 167 tackles, 5 interceptions, 2 fumble recoveries, 5 forced fumbles, 13 passes deflected, and 42 quarterback pressures (hurries) and returned 2 interceptions and 1 fumble recovery for touchdowns. While at the University of North Carolina, Peppers was also a walk-on member of the men's basketball team. The Carolina football coach, Carl Torbush, said he could play football and then be a walk-on for Bill Guthridge on the UNC men's basketball team. He was a reserve on the 1999-2000 Tar Heels team that made it to the Final Four. Peppers was also a reserve on the 2000-2001 men's basketball team. In the NCAA Tournament, Peppers scored 21 points and grabbed 10 rebounds in a loss to Penn State in the second round. After the season, Peppers decided to focus solely on football and did not play basketball in his final season. Peppers was a highly regarded prospect coming into the 2002 NFL draft earning comparisons to Hall of Famer Lawrence Taylor for his ability to dominate a football game. Peppers would end up being selected number 2 overall in the 2002 NFL Draft by the Carolina Panthers behind number 1 overall pick, quarterback David Carr. On September 8, 2002 against the Baltimore Ravens, Peppers played in his first career NFL game, in which he made an impact by deflecting a pass by Ravens quarterback Chris Redman that was intercepted by linebacker Dan Morgan, who proceeded to race 22 yards for a Panthers touchdown with under two minutes remaining in the game; the Panthers won the game 10-7. In Peppers’ second career NFL game, which came on September 15, 2002 against the Detroit Lions, Peppers recorded 5 tackles, 3 sacks, 1 stuff, 1 forced fumble, and 1 pass deflection in helping the Panthers defeat the Lions by a score of 31-7. Later that season in a 14-13 loss against the Dallas Cowboys in week 6, Julius Peppers recorded 3 tackles, 3 sacks, 1 forced fumble, 1 interception, and 1 pass defensed. Peppers also during his rookie season helped the Panthers boast the only defensive unit since the NFL merger in 1970 to improve from last in the league in total defense to second in one season. Peppers would finish his rookie season with 28 solo tackles, 7 assisted tackles, 12 sacks, 5 forced fumbles, 1 interception, 5 passes defensed, and 3 stuffs. For his efforts Peppers would earn the NFL Rookie of the Month Award in October 2002 and the 2002 Associated Press NFL Defensive Rookie of the Year Award. With four games remaining in the season, Peppers was suspended for violating the NFL's substance abuse policy for taking a banned dietary supplement. Peppers would go on to say that he was given a dietary supplement by a friend to help him fight off fatigue. The pills contained an ephedra substance that was banned by the NFL. Peppers said it was an honest mistake on his part and that he would be more cautious in the future. In his second season, he was part of a defensive line that also included Brentson Buckner, Kris Jenkins, and Mike Rucker. Together they would be a key cog that would help the Panthers reach the Super Bowl. As great as the defensive line was, Peppers was the clear attention getter on the defensive line by opposing teams offenses, and would take on double teams to help free up his fellow defensive lineman. Peppers would finish the season with 37 solo tackles, 7 assisted tackles, 7 sacks, 3 forced fumbles, 3 passes defensed, 4 stuffs, and 1 blocked kick, as the Panthers would go on to lose Super Bowl XXXVIII to the Patriots 29-32. Peppers and Donovan McNabb were the only people to ever play in both the NCAA men's basketball Final Four and the NFL's Super Bowl. Peppers would have arguably his best season to date, during the 2004 season he set a record for an NFL defensive lineman by recording a 97-yard interception return in a game against the Denver Broncos on October 10, 2004. Peppers would also set an NFL record by recording 143 total interception return yards which is the most ever recorded in a single season by a defensive lineman. He also had a combined 203 interception and fumble return yards which is the most ever by a defensive lineman in a single season since the NFL merger in 1970. In a game against the Tampa Bay Buccaneers in week 12, Peppers produced one of the NFL's most dominant performances of the season by blocking a 26-yard field goal attempt, recording a 46-yard interception return for a touchdown, which was the first interception returned for a touchdown by a defensive lineman in Carolina Panthers history. Also recorded 1 pass defensed, 1 sack and 4 tackles including one stop in which he chased down Bucs running back Michael Pittman from behind on a 68-yard screen pass in the second quarter. He would also make a memorable play in week 15 against the Atlanta Falcons, which was a Saturday night game held on December 18, 2004, Peppers would grab a fumble in midair by Atlanta Falcons quarterback Michael Vick and race 60 yards the other way for a Panthers touchdown. Peppers would finish the season with 52 solo tackles, 12 assisted tackles, 11 sacks, 4 forced fumbles, 1 fumble recovery, 2 interceptions, 9 passes defensed, 4 stuffs, 1 blocked kick, and 2 defensive touchdowns. For his accomplishments Peppers was named to his first NFL Pro Bowl while also earning a spot on the NFL’s All Pro First-Team. Peppers would also be named the NFL’s Defensive Player of the Month in November, 2004 and finished fourth overall in the voting by the Associated Press for the AP NFL Defensive Player of the Year Award. He would also be named the NFC Defensive player of the Year by the Kansas City Committee, as well as the NFL Alumni Defensive Lineman of the Year. Peppers would help the Panthers make it all the way to the NFC Championship Game before losing to the Seattle Seahawks 34-14. Peppers would record two 3 sack games during the season, one against the Tampa Bay Buccaneers in week 9, in which addition to his 3 sacks, Peppers also recorded 5 tackles and 1 stuff. His other 3 sack effort came against the Dallas Cowboys in week 16, in this game Peppers also recorded 8 tackles, 1 pass defensed, and 1 blocked kick. For the season Peppers recorded 38 solo tackles, 12 assisted tackles, 10.5 sacks, 2 forced fumbles, 1 fumble recovery, 6 passes defensed, 5 stuffs, and 1 blocked kick. Peppers would make his second Pro Bowl for his efforts. Peppers would again record two 3 sack games during the season, one against the Minnesota Vikings in week 2, in which he also recorded 8 tackles, 1 stuff, 1 pass defensed, and 1 blocked kick. And then again in week 10 against the Tampa Bay Buccaneers, he also recorded 4 tackles and 1 pass defensed, Peppers would go on to earn his first NFC Defensive Player of the Week Award for his efforts. On October 15, 2006 in a game against the Baltimore Ravens Peppers became the Panthers' all-time sacks leader after registering 2 sacks during the game, a record that he still holds with a total of 81 career sacks as a Carolina Panther. He would also earn the NFL Defensive Player of the Month Award for the month of October, 2006, his second such award. Peppers finished the season with 49 solo tackles, 9 assisted tackles, 13 sacks, 3 forced fumbles, 2 fumble recoveries, 6 passes defensed, 7 stuffs, and 2 blocked kicks. For his efforts, Peppers earned a trip to his third consecutive Pro Bowl and was also named NFL First-Team All Pro for the second time in his career. Following Panthers safety Mike Minter's retirement after the 2006 season, Peppers was named as the Panthers defensive captain. Peppers had a down season in 2007 after only recording 30 solo tackles, 8 assisted tackles, 2.5 sacks, 3 forced fumbles, 2 fumble recoveries, 1 interception, 5 passes defensed, 1 stuff, and 2 blocked kicks. Before the season started, Peppers suffered from an undisclosed illness and lost both strength and weight which is expected to have played a part in his down season. Peppers also missed the final two games of the season with a sprained MCL in his right knee. The 2008 season was a bounce back year for Peppers who reverted to his usual dominant self after recording a career high 14.5 sacks. Peppers would change from left defensive end to right defensive end before the season, which was the position he played in college at the University of North Carolina. Julius’ best performance of the season came against the Oakland Raiders in week 10, a game in which he recorded 7 tackles, 3 sacks, 2 forced fumbles, and 1 pass defensed, he would earn his second NFC Defensive Player of the Week Award after this effort. Peppers finished the season with 40 solo tackles, 11 assisted tackles, 14.5 sacks, 5 forced fumbles, 5 passes defensed, 4 stuffs, and 1 blocked kick. After the season Peppers earned a spot on the NFC Pro Bowl team, which was the fourth of his career. He also earned Second-Team All Pro honors. The Panthers made the playoffs after the 2008 NFL regular season but lost in the divisional round to the Arizona Cardinals by a score of 33-13. On January 16, 2009, ESPN reported that Peppers told ESPN's Chris Mortensen he did not intend to re-sign a long-term deal with the Panthers and would like to explore options with another team, specifically one with a 3-4 defensive formation. He also expressed the desire or willingness to convert from a defensive end to an outside linebacker. Peppers said he would request a trade if franchise tagged. However, despite his request, the Panthers would place the Franchise tag on him on February 19. The 2009 season would be the last for Peppers as a member of the Panthers. Peppers began the season well by recording 5 tackles, 1 sack, 1 forced fumble, 1 pass defensed, and 1 blocked kick in a week 1, 38-10 loss against the Philadelphia Eagles. But Peppers went without a sack during the next two games against the Atlanta Falcons and Dallas Cowboys, both losses as the Panthers started the season 0-3, causing Panthers linebacker Jon Beason to question Peppers intensity on a radio show in Charlotte, North Carolina. Beason would later admit that he was wrong about saying this about Peppers and said he thought that Julius would go down as one of the best players to ever play in the NFL. Peppers bounced back in week 5 of the 2009 season against the Washington Redskins by recording 5 tackles and 2 sacks in the Panthers first win of the season. In week 8, in a 34-21 win against the Arizona Cardinals, Peppers recorded 2 tackles, 1 sack, 1 forced fumble, 1 interception for a 13 yd. touchdown, and 1 pass defensed earning him his third NFC Defensive Player of the Week Award. In week 9, in a 30-20 loss against the New Orleans Saints, Peppers broke his right hand, but continued to play with a cast on his hand over the next few games. In week 15 against the Minnesota Vikings, Julius Peppers played one of his best games of his career, although only recording 1 tackle, 1 sack, and one pass defensed, Peppers also had 5 quarterback hurries and was all over the field, causing sports writer Peter King to say that Peppers looked like Lawrence Taylor and Deacon Jones rolled into one dominant force. Peppers played so well he caused Vikings Pro Bowl left tackle Bryant McKinnie to be benched by Vikings head coach Brad Childress. Peppers' effectiveness not only prompted Childress to switch tackles, but to also consider making a quarterback change, which Vikings quarterback Brett Favre strongly resisted. Childress said he wanted to protect Favre, whom he said was getting his rear end kicked and was taking a beating. In week 17, which came on January 3, 2010, in a 23-10 win against the New Orleans Saints played at Bank of America Stadium in Charlotte, North Carolina, Julius Peppers played in his final game as a member of the Carolina Panthers. Peppers recorded 3 tackles, 1 interception, and 1 pass defensed. The interception Peppers recorded was the final play of his Panthers career. Julius finished the season with 36 solo tackles, 6 assisted tackles, 10.5 sacks, 5 forced fumbles, 1 fumble recovery, 2 interceptions, 5 passes defensed, 3 stuffs, 1 blocked kick, and 1 defensive touchdown. Peppers was voted to his fifth Pro Bowl and also earned Second-Team All Pro honors. On February 22, 2010, Adam Schefter reported that the Panthers would not place the franchise tag on Peppers, leaving him an unrestricted free agent, free to pursue a contract with another team. On March 5, 2010, the Chicago Bears signed Peppers  to a six-year contract worth $91.5 million, with $42 million guaranteed in the first three years. Peppers made an immediate impact in Week 1 vs. the Detroit Lions by sacking quarterback Matthew Stafford and forcing a fumble with 29 seconds to go in the first half. In Week 5, Peppers went back to his home state to play against his former team, the Carolina Panthers, a game in which he and the Bears won by a score of 23-6. His biggest play of the game was when he tipped a Jimmy Clausen pass and proceeded to intercept it, by diving underneath the ball, after the play, Peppers proceeded to hush the booing crowd by raising his index finger to his lips. Peppers finished the game with 4 tackles, 1 interception, and 1 pass defensed. In week 11 against the Miami Dolphins, Peppers recorded his first 3 sack performance as a member of the Chicago Bears, he finished the game with 6 tackles, 3 sacks, and 1 pass defensed which earned him his fourth NFC Defensive Player of the Week Award of his career. Peppers would also win the NFC Defensive Player of the Month Award for November, 2010 making it the third time in his career he earned the award. In Peppers first year as a Bear, he helped them make the playoffs for the first time since the 2006 season, and came within one game of reaching the Super Bowl, but ultimately lost to the Green Bay Packers in the NFC championship game 21-14. Peppers finished the season with 43 solo tackles, 11 assisted tackles, 8 sacks, 3 forced fumbles, 2 interceptions, 9 passes defensed, 5 stuffs, and 1 blocked kick. His impact was most felt with regards to putting pressure on opposing quarterbacks, redirecting running plays, or assisting on the tackle. Julius was voted to his sixth Pro Bowl and was named to his third, First-Team All Pro team. Peppers also finished fourth in voting for the NFL's 2010 AP Defensive Player of the Year Award, which was won by Pittsburgh Steelers safety Troy Polamalu. Peppers improved on his 2010 season in 2011 starting all 16 games and leading the Bears defense with 11 sacks despite facing constant double teams, and also playing much of the season with a sprained MCL in his left knee that he injured in week 5 against the Detroit Lions. But Peppers was still able to record 33 solo tackles, 4 assisted tackles, 11 sacks, 3 forced fumbles, 2 fumble recoveries, 4 passes defensed, 6 stuffs and 2 blocked kicks. Peppers was awarded his fourth career NFC Defensive player of the month award for November as he collected 6 tackles, 4 sacks, and 3 pass breakups. In Week 17 facing the Vikings, Peppers was awarded a .5 sack by the league, that he originally split with fellow Bears defensive lineman Matt Toeaina, giving him his 100th career sack making him the twenty eighth player in NFL history to achieve that milestone. For his efforts Peppers was elected to the Pro Bowl which was the seventh of his career. During the 2012 season, Peppers played with plantar fasciitis, though he was able to record 11.5 sacks on the season, becoming the first Bears player to record ten sacks or more in back-to-back years since Rosevelt Colvin, and the first Bear to record at least 11 sacks in two consecutive seasons since Richard Dent. Peppers also recovered a career-high four fumbles, which tied for the league lead. In week 16, in a 28-13 win against the Arizona Cardinals, Peppers recorded 5 tackles, 3 sacks, 1 stuff, 1 forced fumble, and 1 pass defensed making it the ninth time in his career that he had recorded at least 3 sacks in a game, for his efforts Peppers earned his fifth career NFC Defensive Player of the Week Award. Peppers finished the season with 32 solo tackles, 7 assisted tackles, 11.5 sacks, 1 forced fumble, 4 fumble recoveries, 2 passes defensed, 3 stuffs, and 1 blocked kick. He was named to the 2013 Pro Bowl, his fifth consecutive, and eighth of his career, and was also selected to the NFL's 2012 All-Pro Second Team. Peppers also received the Bears Brian Piccolo Award given annually to the player that best exemplifies the courage, loyalty, teamwork, dedication and sense of humor of the late Bears running back Brian Piccolo. 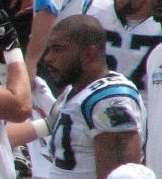 On June 5, 2013 Profootballtalk.com named Julius Peppers to their Carolina Panthers Mount Rushmore as one of the teams most significant players in franchise history. On July 31, 2013 EA Tiburon revealed that Peppers was named to their "Madden NFL All-25 Team." During the Chicago Bears 2013 training camp, Peppers said after one of the Bears practices that he felt 25 years old, and that he wanted to win the first Deacon Jones Award, which was to be given to the player that lead the league in sacks. In week 3 of the 2013 NFL season in a game against the Pittsburgh Steelers, Peppers returned a fumble recovery 42 yards for a Bears touchdown with under four minutes remaining in the game to help seal a Bears victory by a score of 40-23. It was the second fumble recovery Peppers had returned for a touchdown in his career, as well as his fourth touchdown scored. In the Bears week 11 game against the Baltimore Ravens, Peppers had a monster game and recorded a career-high 11 tackles as well as 2 sacks and 2 more tackles for loss in helping the Bears defeat the Ravens in overtime by a score of 23-20. Peppers finished the season with 31 solo tackles, 14 assisted tackles, 7 sacks, 2 forced fumbles, 1 fumble recovery, 1 interception, 3 passes defensed, 2 stuffs, and 1 defensive touchdown. On March 11, 2014, Peppers was released by the Bears after attempts to trade him were unsuccessful. Peppers signed a three-year deal with the Green Bay Packers on March 15, 2014. The deal was worth $30 million with $8.5 million in first year, and $7.5 million guaranteed, which is basically a one-year contract, which can easily be extended by the Packers if they feel that Peppers works well with a 3-4 defense, despite having played in a 4-3 defense his whole professional career. Peppers signed with the Packers because he felt like they have a good chance at winning the Super Bowl and he felt like he could help them accomplish that goal. He also stated that he's wanted to play in a versatile defense his entire career, and the Packers run a versatile 3-4 defense under their defensive coordinator Dom Capers. Green Bay Packers head coach Mike McCarthy said that Peppers will be used as a hybrid multiple-position player along the defensive front in a position the Packers have labeled "Elephant" and will play linebacker, defensive end, and defensive tackle for them in 2014. Julius Peppers will wear jersey number 56 for the Packers in honor of former great New York Giants outside linebacker, and fellow North Carolina alumnus, Lawrence Taylor. 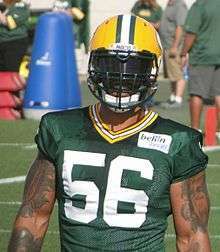 In week 3 of the 2014 NFL season, Peppers recorded his first sack as a Green Bay Packer and also recorded his 40th career forced fumble and 15th career fumble recovery on the same play. It happened in a losing effort against the Detroit Lions by a score of 19-7. In week 5 of the 2014 NFL season Peppers recorded his tenth career interception and raced 49 yards to score the fifth touchdown of his career. In doing so, Peppers became the first player in NFL history to record at least 100 sacks and 10 interceptions,  he also recorded 3 assisted tackles 1 being for a loss of yards, a pass defensed, and a half-sack in helping the Packers defeat the Minnesota Vikings by a score of 42-10. For his efforts against the Vikings, Peppers was named the NFC defensive player of the week for the sixth time in his career, making him along with Chris Doleman the only two players to win the award with three different teams. Peppers also became the first player since sacks became an official statistic in 1982 to record at least a half-sack and an interception-return touchdown in three different games. Peppers said that he is having the time of his life playing outside linebacker for the Green Bay Packers. In week 10 Julius Peppers gave an inspiring speech to his teammates before playing his former team the Chicago Bears. Peppers recorded 4 tackles, 2 passes defensed, and a sack, forced fumble, and fumble recovery on the same play against Bears quarterback Jay Cutler. The Packers blew out Peppers' former team by a score of 55-14. In week 11, Peppers recorded 2 tackles and his 11th career interception which he returned 52 yards for a touchdown, becoming the first player in NFL history to record at least 100 sacks and 4 interception-return touchdowns. It was Peppers sixth career touchdown scored including both interceptions and fumble recoveries returned. The Packers defeated the Philadelphia Eagles 53-20. Peppers finished the season with 29 solo tackles, 15 assisted tackles, 7 sacks, 4 forced fumbles, 3 fumble recoveries, 2 interceptions, 2 defensive touchdowns, 11 passes defensed, and 4 stuffs. In the Divisional playoff game against the Dallas Cowboys, Peppers would have a dominant performance by leading the Packers in tackles on the day with 6, sacking Dallas quarterback Tony Romo and forcing a fumble on the third play of the game, then drew a holding penalty, and later forced a fumble of running back DeMarco Murray in the third quarter that the Packers recovered and prevented what looked like a clear run to the end zone for Murray. The Packers went on to defeat the Cowboys 26-21. The Packers would advance to play the Seattle Seahawks in the NFC Championship Game. Peppers would put on another dominant playoff performance by recording 5 tackles, 1.5 sacks, 3 quarterback hits, and put lots of pressure on Seahawks quarterback Russell Wilson throughout the game, but ultimately the Packers would fall short in overtime by a score of 28-22. Peppers started his fourteenth NFL season off with a bang against his former team, the Chicago Bears. Peppers recorded 6 tackles and 1.5 sacks on the day and in doing so passed former Kansas City Chiefs great Derrick Thomas for fifteenth most sacks in NFL history, as well as helping the Packers defeat the Bears by a score of 31-23. In week 15, against the Oakland Raiders, Peppers recorded 4 tackles and 2.5 sacks which moved him past fellow North Carolina alumni and former New York Giants legendary linebacker Lawrence Taylor into tenth place on the all-time NFL sacks list, giving him 135 career sacks. The Packers beat the Raiders by a score of 30-20. Peppers finished the season with 25 solo tackles, 12 assisted tackles, 10.5 sacks, and 2 stuffs. He was also selected to his ninth Pro Bowl. Peppers helped the Packers reach the playoffs and win their wild card round playoff game against the Washington Redskins by a score of 35-18, he had several QB pressures and 2 tackles in the game. In the next round against the Arizona Cardinals, Peppers would record several more QB pressures and a sack, but the Packers would go on to lose the game in overtime 26-20. In week 13 against the Houston Texans, Julius Peppers helped the Packers win the game 21-13, he recorded 5 tackles and 1 sack in the game which gave him 142.5 career sacks and moved him past New York Giants great Michael Strahan for 5th most sacks in NFL history. Peppers, who is considered one of the greatest defensive players in NFL history, made his case stronger to be a first ballot hall of famer after his retirement. In February 2009, Peppers donated $500,000 to a scholarship program that supports black students at his alma mater of North Carolina. Peppers's donation will go to the Light on the Hill Society Scholarship, a tribute to UNC's earliest black graduates. It helps alumni and friends support black freshmen who show the potential for academic excellence at UNC and after they graduate. ↑ 2011 NCAA Football Records Book, Award Winners, National Collegiate Athletic Association, Indianapolis, Indiana, p. 11 (2011). Retrieved June 24, 2012. ↑ "Peppers earns comparisons to Lawrence Taylor". Maxwellfootballclub.org. Retrieved 2013-08-07. ↑ "Julius Peppers draft profile". Web.archive.org. Archived from the original on 2002-08-05. Retrieved 2013-08-07. ↑ (2002-09-08). "Julius Peppers' first NFL game". Scores.espn.go.com. Retrieved 2013-08-07. ↑ (2002-09-15). "Julius Peppers' second NFL game". Espn.go.com. Retrieved 2013-08-07. ↑ "Julius Peppers' stats". Espn.go.com. 1980-01-18. Retrieved 2013-08-07. ↑ Wilner, Barry (2003-01-06). "Peppers sacks his way to rookie honor". Usatoday30.usatoday.com. Retrieved 2013-08-07. ↑ "Peppers is the attention-getter on Carolina's outstanding defensive line". News.google.com. Retrieved 2013-08-07. ↑ Hendricks, Maggie (2010-08-06). "7 things you may not know about Julius Peppers". Nbcchicago.com. Retrieved 2013-08-07. ↑ "Panthers coach Fox: 'Pep's a heck of a player'". Articles.chicagotribune.com. 2010-03-08. Retrieved 2013-08-07. ↑ Mason, Andrew. "Julius Peppers bio". Panthers.com. Retrieved 2013-08-07. ↑ Bill Syken (2005-09-05). "Defensive end extraordinaire Julius Peppers". Sportsillustrated.cnn.com. Retrieved 2013-08-07. ↑ "Peppers finishes 4th in 2004 DPOY voting". Sports.espn.go.com. 2005-01-07. Retrieved 2013-08-07. ↑ (2006-01-22). "Panthers vs. Seahawks, 2005 NFC championship". Scores.espn.go.com. Retrieved 2013-08-07. ↑ "Julius Peppers 2005 game log". Espn.go.com. 1980-01-18. Retrieved 2013-08-07. ↑ "Julius Peppers 2006 game log". Espn.go.com. 1980-01-18. Retrieved 2013-08-07. ↑ Colston, Chris (2006-11-24). "Quiet Peppers spices up Carolina defense". Usatoday30.usatoday.com. Retrieved 2013-08-07. ↑ "New Sack King in Carolina". Car.scout.com. 2006-10-18. Retrieved 2013-08-07. ↑ Peppers comfortable with new role at right defensive end Archived March 16, 2014, at the Wayback Machine. ↑ "Julius Peppers 2008 game log". Espn.go.com. 1980-01-18. Retrieved 2013-08-07. ↑ "Panthers franchise Peppers". Sports.espn.go.com. 2009-02-19. Retrieved 2013-08-07. ↑ "Beason changing tune on ex-teammate Peppers". Necn.com. 2010-10-06. Retrieved 2013-08-07. ↑ "Hand injury limits Peppers". Sports.espn.go.com. 2009-11-23. Retrieved 2013-08-07. ↑ Chandler, Charles (2009-12-23). "Peppers revs his motor against vikings". Nydailynews.com. Retrieved 2013-08-07. ↑ Julius Peppers final play as a Panther Archived January 30, 2012, at the Wayback Machine. ↑ "Schefter tweets that Panthers will not franchise Peppers". Twitter.com. Retrieved 2013-08-07. ↑ Damon Hack (2010-09-06). "Chicago's Leap of Faith". Sportsillustrated.cnn.com. Retrieved 2013-08-07. ↑ Wright, Michael. "Peppers relishes his fresh start". Espn.go.com. Retrieved 2013-08-07. ↑ "Peppers, Bears finalize deal". Sports.espn.go.com. 2010-03-06. Retrieved 2013-08-07. ↑ "Carolina, on his mind". Articles.chicagotribune.com. 2010-10-09. Retrieved 2013-08-07. ↑ Peppers' interception vs. Panthers Archived November 7, 2013, at the Wayback Machine. ↑ Polamalu wins 2010 NFL Defensive Player of the Year Award Archived November 6, 2012, at the Wayback Machine. ↑ "Julius Peppers plays with sprained MCL". Espn.go.com. 2011-10-17. Retrieved 2013-08-07. ↑ ESPNChicago.com. "Julius Peppers wins fourth Defensive Player of the Month Award". Espn.go.com. Retrieved 2013-08-07. ↑ "Julius Peppers records 100th career sack". Profootballweekly.com. Retrieved 2013-08-07. ↑ Wright, Michael C. "Stock Watch: Peppers' healthy effort". Espn.go.com. Retrieved 2013-08-07. ↑ Mayer, Larry (2012-12-26). "Five Bears players voted to Pro Bowl". Chicago Bears. Retrieved 2013-08-07. ↑ Mayer, Larry (2013-08-02). "To Julius Peppers,'age is just a number'". Chicago Bears. Retrieved 2013-08-07. ↑ Mayer, Larry (2013-05-26). "Peppers named 54th best player in NFL". Chicago Bears. Retrieved 2013-08-07. ↑ Mayer, Larry (2013-04-23). "Peppers driven to continually improve". Chicago Bears. Retrieved 2013-08-07. ↑ "Madden NFL All-25: DE Julius Peppers". Easports.com. 2013-07-29. Retrieved 2013-08-07. ↑ Wright, Michael C. "Peppers setting sights on first sack award". Espn.go.com. Retrieved 2013-08-07. ↑ "Peppers makes big donation to UNC". chicagotribune.com. Retrieved 2012-08-21.